It's finally starting to feel like fall here in the Midwest. The leaves are changing colors, the air is crisp, and pumpkins are everywhere. This recipe is one of my family's favorites to warm up to. 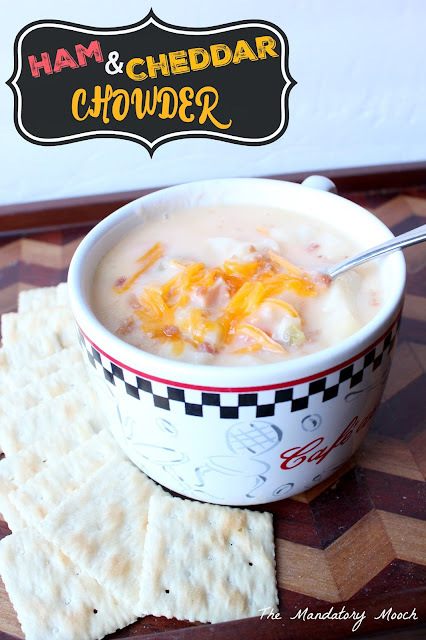 It is a creamy chowder that warms you from head to toe. Bring the veggies and water to a boil in a large pot. Boil until tender, approximately 15 minutes. Reduce to medium heat. Mix these three ingredients together in a small bowl with a whisk. Gradually add to vegetables in water and stir thoroughly. 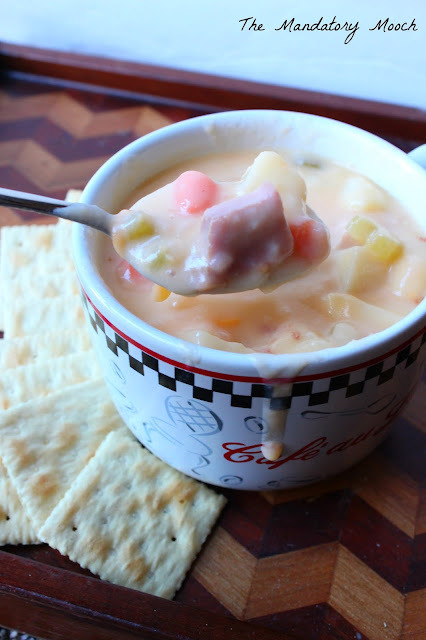 Add ham and cheese to chowder, saving a little of the cheese to sprinkle on the top of servings. Mix and heat thoroughly. Serve with bacon bits, cheese, and crackers. This sounds so good. It is still in the 90s here, but next week it is reported to cool off. I'm keeping this one on hand. Sort of ham and cheese in a bowl!! Looks AMAZING! Thanks for sharing on the What’s for Dinner link up and don’t forget to leave a comment at the party – Next week’s features that also leave a comment get pinned, yummed and tweeted! yum yum yum. I love chowders. Thanks for sharing with us at Family Joy Blog Link Up Party this week. Thank you for sharing with us at #HomeMattersParty .We would love to see you again next week.